This Benzoyl Peroxide Acne Medication cream used for the treatment of acne, to exfoliate and fight bacteria. 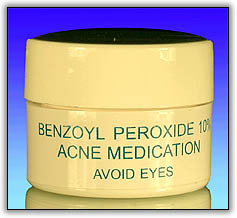 Benzoyl Peroxide 10% is a very effective treatment for more severe acne and also for acne on the back and chest. Cleanse skin thoroughly. Take a small amount of product and apply a thin layer daily to the effected area. You may incrase the number of application gradually to 2-3 times daily. If skin feels dry (which is expected) apply a small amount of Acne Moisture Balancing Cream. Deionized Water, Propylene Glycol, Carbomer 940, Sodium Hydroxide, Methylparaben, Propylparaben, Fragrance..